On Thursday, Pocharam participated in the election campaign at Mallaram, Antaram Tanda, Pottigutta Tanda’s of Varni mandal in Kamareddy district. 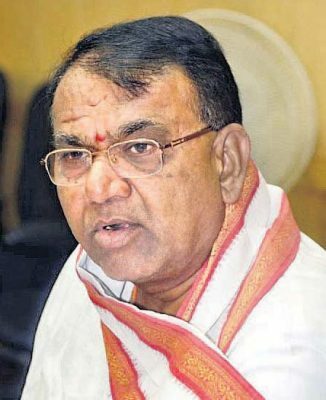 Nizamabad: The TRS has fulfilled its promise of converting tandas as gram panchayats and provided local government to the tribal people, said State agriculture Minister Pocharam Srinivas Reddy. On the occasion, the Minister interacted with tribals and said that the TRS government had fulfilled the promise of converting tandas as gram panchayats and provided their own government in the form of panchayats. He said that earlier in Congress and TDP governments, tandas were neglected and not provided basic amenities like roads, drinking water facilities and other amenities. But, the TRS government improved the basic amenities in tandas, constructed BT Road to each tanda and built CC roads. In future, the government would provide pattas to the tribals cultivating reserve forest lands. Pocharam said through Mission Bhagiratha, the government aims to provide safe drinking water to the Tandas. It is also constructing double bedroom houses to for the tribals. Among others, it has also reduced the pensionable age from the present 65 years to 57 years and increased Aasara pensions from Rs 1,000 to Rs 2,016. The Minister also said at present the government was providing Rs 8,000 per acre under the Rythu Bandhu scheme, and it should be increased to Rs 10,000 per acre in future. He said through the Kaleshwaram project Godavari water would reach Nizamsagar. He promised to a new lift irrigation scheme on Nizamsagar canal at Jakora. To ensure continuity of the development works, Pocharam urged the tandas and tribals to vote for the TRS and make Chandrashekhar Rao the Chief Minister again.